Hiroki Endo calling his manga ‘Eden‘ is a hint. Eden is supposed to be a paradise on Earth, but Endo‘s version is more like Hell. It’s sarcasm on his part, I think, because this is a contrary and brutal series, where anything that’s good is crushed and anything that’s innocent is (often literally) raped. For the last few days I’ve hardly been able to believe my eyes whilst reading this; everyone keeps dying, and even those who do survive, do so minus their humanity, or, even worse, minus their eye-balls. I won’t try to explain the plot. the writing operates on too broad a canvas to summarise briefly, but, obviously, this is a story concerned with the future of mankind. It’s a very Ghost in the Shell-informed future, in the way that people have begun sacrificing their natural bodies for technology upgrades; arms are transformed into extendible knives and faces spoilt by mechanical augmentation, but where Ghost in the Shell was usually set amongst society’s upper echelons, Eden is in the slums with the prostitutes and drug-dealers. The characters are desperate; people desperate to escape, but repressed by poverty and corruption. The art is beautiful in a way that’s ultimately horrifying. I’m not sure I’d find this quite as affecting if it not for the cleanness of the drawing. It’s perfect, really, so perfect, in fact, that a character’s physical imperfection stands out all the more; the gross, virus-ridden skin; a myriad of artificial bones and muscles visible to the naked eye; wires plugged into beautiful faces. The clarity is such that one may feel the compunction to look away when things get bad. One nasty example I still can’t shake is when an important character steps on a land-mine. In any other manga, this character (an innocent, optimistic, pretty girl) would survive, but in Eden, she regains her consciousness, only to find that her lower half is missing. Well, at least I know to aviod this manga. I hate tragedy, and I hate this type of scifi. I like the “clean” type of scifi, like Star Trek, or Banner of the Stars (which is pretty much the only Japanese-made scifi story that I like for its science fiction as well as its story). I’m curious, though, is there some sort of a message in “Eden”, does it criticize society or human nature or something? For me, some kind of a deep message is the only reason I’d consider reading such brutal tragedy. There’s enough tragedy in the real world (although, fortunately, my own life so far has been easy enough), stories are a way for me to escape the reality. I’m very much an escapist, I love fantasy as a genre and I like happy endings. But sometimes, when I’m in the right mood, I do enjoy a harsh story, as long as it gives me something insightful to think about. Ultimately, I haven’t finished reading it yet, but I’ll be surprised if Eden has a happy ending. It’s just not that kind of story, really, but at the same time, it’s definitely all about social commentary and human nature. The character development is particularly good, especially if you’re into your anti-heroes. There’s this one guy, Kenji (he’s pictured above, holding his dead brother(! ),) who is a total psychopath. When we meet him, he’s an emotionally dead assassin, but over the course of the series, he begins to reconnect with his humanity; in the last chapter I read yesterday, he shed a tear for the first time. So, yeah, if I gave the impression this is all about violence and cruelty, I was wrong. Eden is not Violence Jack or something equally as crude, the characters have nuance and heart and change over time. I would recommend it to anyone that reads this blog; it takes three or four volumes to really start rolling, but I’m up to volume 9 right now and I’m absolutely head over heals in love with it. As for “clean” sci-fi, have you managed to catch ‘Legend of the Galactic Heroes’ yet? If we’re going to talk about anime and space operas, LoGH is right up there as one of the definitive examples. Hmm… No, not yet. The name has managed to scare me away so far. But if you recommend it, I might take a look. While I don’t always agree with your taste, I appreciate it well enough. I guess I should say “thanks” for introducing me to this series, but it isn’t exactly a pleasant ride. Nevertheless I’m part of what must surely be a small minority of people who can sit through such tragic works, so I will continue reading. Thanks for commenting and I hope you’re ‘enjoying’ Eden, Jack, as much as one can ‘enjoy’ something like this. I love Eden. It -is- brutal at times but it’s one of the best recent mangas. Have you read Endo’s shorts as well (Tanpenshu 1 & 2)? They’re both excellent and fairly bleak too. And Endo writes the best end of volume columns too! I really do like his stuff. Yeah, I think Endo’s personality really comes through with those columns; he reads like he really loves what he’s doing, as well as being quite sarcastic and self-critical. Oddly, I actually started reading Eden after starting with his new series first, All-rounder Meguru. It’s totally different to Eden, being a very light-hearted/slice of life-esque take on mixed martial arts pro-fighters (it’s a lot like Hajime no Ippo, actually!) I haven’t read Tanpenshu yet, but I definitely shall now, so thanks for the rec. Between this, “Kino’s Journey”, “Grave of the Fireflies” and “Now and then, Here and Now”, various volumes of “Bersek” as well as “Evangelion” my tolerance level for bad stuff happening, followed by worse stuff happening is fairly high. The problem such works can fall into is just killing of every character without any reason, and if that happens too often then the reader never bothers to becomes attached to anyone. I’ll have to wait till I finish it to assess whether it works as a whole. I know what you mean, and, in a way, I think that this might be Eden’s Achilles Heel. I’m writing this comment now after reading a chapter last night where my favourite character in the whole series so far gets ‘whacked’ for no apparent reason. I’m not sure yet if Endo has any method to his madness, or, if it’s just, well, madness! I was reading the series and discussing it with someone else online. When we both got to the point you are discussing (and I am sure it is the same point) we were fairly shocked. Some how, this character had become our favourite character too (not sure why yet) and when this event happened it had me fuming for about five hours. As someone who has just finished the series as a whole, this event really stands out as the only occasion that something unnecessary happens, with little explanation or ceremony. Endo is a bad man. Hey bateszi, it’s been a long time since I’ve last visited this blog. And here I am know reading a post about my favourite manga. As luck would have it, Eden is one of the few adult mangas that have been published in Poland. I grabbed the first volume back in 2002 or so not knowing what to expect and I immediately fell in love. The drawing style and the level of detail are trully breathtaking, but the main strengths of this manga lie elsewhere. It’s all about the character’s struggles. It’s about young people’s ideals being crushed in the face of harsh reality, about trying hard but faling more often than not. 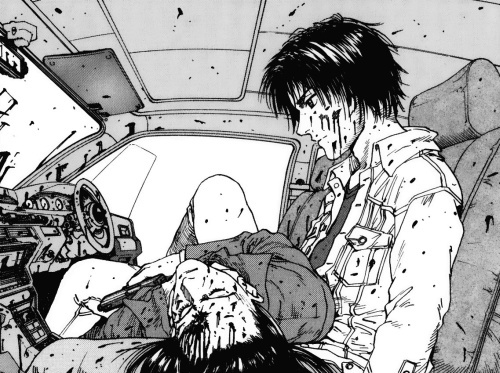 Eden is shocking because it does what other mangas rarely do – proves, that people are not immortal. Characters die here. Sometimes because they deserved it, sometimes in a pointless way simply because they were in a wrong place at the wrong time. Eden also shows that there are no perfect people. Everyone has flaws. The characters struggle with their problems, try to make things better, but makes many mistakes along the way. That’s what makes them feel so real. In the end, Endo’s view of how humanity works, being able to do everything for survival and/or money, may be a bit exaggerated, but it does show the darker side of humanity in an interesting and refreshing way. It’s pretty interesting that Eden has been published in Poland. Has it been translated (into Polish,) too? And presumably uncensored? I’m still reading it at the moment, so, it’s hard for me to comment on Endo’s overall picture, but I’m still loving it (even if the guy keeps killing off my favourite characters, now I’m just hoping Kenji survives the ‘cut!’) Particularly, I really like how it depicts the melding of man and technology, it’s quite grim, but also fascinating, and that none of the characters are above doing some really violent and dirty things. Nice to hear from you again, anyway, Johny. Later on the story digs too deep into some pseudo technological mumbo jumbo for my tastes, but it still lead to a rather satisfying finish with some philosophical questions hanging in the readers head. Interestingly enough, Eden has received fairly widespread recognition and distribution. I remember coming across volumes of it in my local library, actually! They didn’t have the beginning ones so I decided to skip out on reading it until recently.